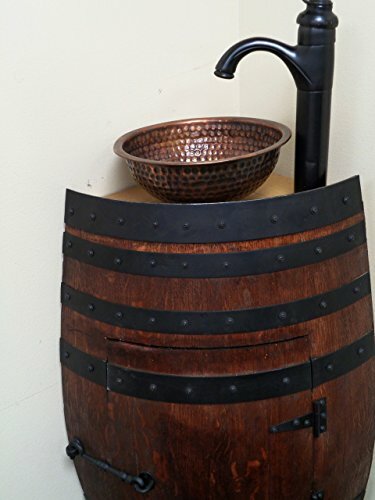 Mini Oak Wine Barrel Corner Bathroom Vanity Sink with Hammered Copper Vessel Sink and "Oil Rubbed" Bronze Faucet in rustic chestnut finish. Item includes bronze hardware and bands. Measuring a compact 35" height by 22" width by 14" depth at the girth. The top is 12" on the sides. We strive to offer you the ultimate balance of form and function. WHY DO WE ONLY USE FRENCH WINE BARRELS? Barrel-destined oak trees ideally grow in cool climates, which gives them a chance to mature slowly and develop a desirable tight grain. Most of the French oak for barrels comes from one of five forests, some of which were originally planted during Napoleonic times for shipbuilding. The main forests, mostly located in central France, are Allier, Limousin, Nevers, Tronçais and Vosges, and each is considered to have distinctive characteristics.